All international orders will show the final sale price on the label. No items will be "marked as a gift", falsifying a sale price is illegal - please do not ask. Goldmine Standard Grading: SS / NM- / VG++ / VG+ / VG / G+ / G / P I grade conservatively. For more details concerning grades, please see my scale below the record description. I've included all the info with pics and sound files below to provide a better idea of the condition. Please read further for more details. VG+ (7 to 7.5 / 10). This is a conservative grade. Cleaned on a 16.5 VPI machine. This is a full play grade. There are light sleeve scuffs and light marks, none detectable to the touch. Some light background noise along the way but overall a very enjoyable listen. Looks exactly as the pictures indicate. Song 6, side 1 credited to P. Overall rather clean with light needle tracks. Matrix photos indicate the pressing. I've included sound clips below, please listen carefully for an accurate sample of the record during actual playback. This is a full play grade! Labels look exactly as pictured. Please judge the playback for yourself at the full clip below. I use a Pioneer PL-530 direct drive with an Empire Cartridge / Stylus 1200 ED setup. The sound you hear below comes directly from the record and is not edited in any way aside from making the clip(s). This is a conservative visual grade as well as a complete play grade. Again, please feel free to check the sound below! +- - - - - - - - - - - -.- - - - - - - - - - - - -+. Direct from playback at 192kbs.. +- - - - - - - - - - - - Side 2 - - - - - - - - - - - - -+. +- - - - - - - - - - - - - - - - - - - - - - - - - - - - - - - - -+. Cover / Sleeve grade: strong VG+ or better This is a conservative grade. Rather nice original cover here. Print crack at top corner at mouth, not open though. Other edges look great, quite nice and sharp. Spine print looks great as shown. Light foxing to the cover overall due to age. Bright color on the front cover. Back print also in nice shape. Copyrighted 1956 on the back. Please see the pictures and inspect them carefully for the best idea of condition. Record ships outside the cover in a new plain paper sleeve, all inside an outer poly sleeve. Original inner sleeve is included. Please inspect the pictures well for something I may have missed mentioning. I've enjoyed the record while I've owned it, its time to let it go to make room for more acquisitions. I try to be conservative when grading, I hope my description was sufficient. I do the very best I can to properly describe every record I sell and take record collecting very seriously. Goldmine Grading Details SS = Still Sealed any defects will be listed and/or photographed to complete the description NM- = Near Mint Minus just short of perfect - acceptable defects would include a hairline mark not detectable to the touch and not affecting playback, background noise is nearly silent VG++ = Very Good Plus Plus most records I will list fall under this grade, just short of NM- but may have a mark or contact wear to the label to grade it slightly lower, maybe a drill hole or saw cut, maybe a mark or name written on the label lightly, sound is still great, loud and near perfect, cover may have slight edge or corner wear, maybe slight ring wear VG+ = Very Good Plus a great record, sound is high quality though may have a few pops or clicks, overall very nice looking vinyl possibly with light marks & scuffs, labels may have a name or mark on them, possible light contact wear to the label, covers may have a small split but not large or gaping, edge wear on cover may show more than slight, may be a mark on cover VG = Very Good only records I will list with this grade would be rather rare or of higher book value, meant to sell as a filler until a better record comes along, vinyl may have feel-able marks but should play through without skipping, pops or clicks may be louder than usual, may have marks or wear on the label, cover may have open splits, wear on print, may have marks or other very apparent defects (all will be stated in description either by type or in the pictures). 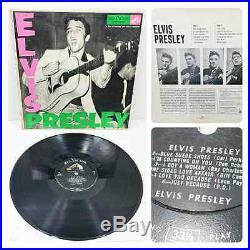 The item "ELVIS PRESLEY s/t 1254 RCA 1st rare label NEON Long Play VPI clean Hear! NICE LP" is in sale since Thursday, February 04, 2016. This item is in the category "Music\Records". The seller is "the-record-dude" and is located in Merritt Island, Florida. Sleeve Grading: strong VG+ or better = clean / see the many pics! Play Grade:: Yes, this record has been fully play graded.